Inorganic Frameworks as Smart Nanocarriers for Drug Delivery brings together recent research in the area of inorganic frameworks for drug delivery. Different types of nanocarriers are presented and discussed in detail, providing an up-to-date overview on inorganic nanoparticles with pharmaceutical applications. 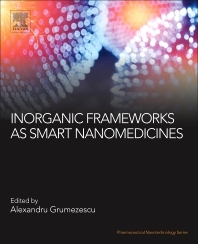 Written by a diverse range of international academics, this book is a valuable reference resource for researchers in biomaterials, the pharmaceutical industry, and those who want to learn more about the current applications of inorganic smart nanocarriers.